With the unparalleled power of the world's first native 64-bit real-time strategy game engine, Ashes of the Singularity: Escalation allows for maps of unprecedented size and detail. Huge map sizes can house over a dozen players at once and are perfect for a "comp stomp" or a chaotic free-for-all. Over the course of your war, you will upgrade your buildings and technology, build orbitals, construct thousands of units, and conquer the regions of the world in an effort to annihilate all opposition. Play as the Post Human Coalition or their eternal foes the Substrate as you battle for control of the galaxy planet by planet. Each side has their own unique array of abilities, units, and research options, allowing you a variety of choices while you build your armies. The global view feature lets you use your mouse wheel to zoom out to exercise greater control over your armies. Easily see the entire battlefield and control large groups of units effectively. Surprise your enemies with upgraded, fortified defenses to keep your Nexus safe and back your armies up in the midst of intense battles. 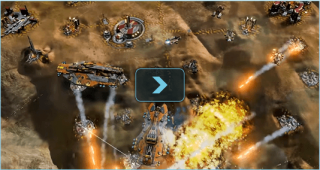 Escalation's single player skirmishes and scenarios pit you up against what is arguably the most sophisticated AI ever seen in a real-time strategy game. As the conqueror of an entire world, you will be battling on multiple fronts with multiple armies. Scouting your opponent's strategy, determining their priorities, tracking where they are, and capturing strategically vital resources will lead to victory. This page was last edited on 21 February 2018, at 01:48.